Escalation is now a structural fact embedded in the war in the Middle East and the Ebola crisis here at home. Sometimes it seemed that only two issues mattered in the midterm election campaigns just ended. No, I’m not talking about Obamacare, or the inequality gap, or the country’s sagging infrastructure, or education, or energy policy. I mean two issues that truly threaten the wellbeing of citizens from Kansas, Colorado and Iowa to New Hampshire and North Carolina. In those states and others, both were debated heatedly by candidates for the Senate and House, sometimes almost to the exclusion of anything else. You know what I’m talking about—two issues on the lips of politicians nationwide, at the top of the news 24/7 and constantly trending on social media: ISIS and Ebola. Think of them as the two horsemen of the present American apocalypse. In 2015, you’re going to hear far more about protecting Americans from everything that endangers them least, and especially about the need for a pusillanimous president (or so he was labeled by a range of Republicans this campaign season) to buckle down, up the ante and crush the Islamic State, that extreme Islamist mini-oil regime in the middle of an increasingly fragmented, chaotic Middle East. You already know the tune: more planes, more drones, more bombs, more special ops forces, more advisers and more boots on the ground. After thirteen years of testing, the recipe is tried and true, and its predictably disastrous results will only ensure far more hysteria in our future. And count on this: oppositional pressure to escalate, heading into the presidential campaign season, will be a significant factor in Washington “debates” in the last years of the Obama administration. Keep this in mind as well: we’re talking about a country that has lived in a phantasmagoric landscape of danger for years now. It has built the most extensive system of national security and global surveillance ever created to protect Americans from a single danger—terrorism—that, despite 9/11, is near the bottom of the list of actual dangers in American life. As a country, we are now so invested in terrorism protection that every little blip on the terror screen causes further panic (and so sends yet more money into the coffers of the national security state and the military-industrial-homeland-security-intelligence complex). Now, a terror disease has been added into the mix, one that—like a number of terror organizations in the Greater Middle East and Africa—is a grave danger in its “homeland,” just not in ours. Bloody and barbaric as it may be, it’s also a remarkably resourceful movement with a powerful sense of how to utilize its propaganda skills, especially on the Internet, to attract recruits, gain support in worlds that matter to it and drive the US national security state and Washington over the edge. It can act or react in ways that will only lead the Obama administration to up the ante in its war. As it has already done, it can continue to produce beheading videos and other inflammatory online creations, which have had a powerful escalatory effect here. It has also learned that it may, after a fashion, be able to call out the “lone wolves,” the loose nuts and bolts of our world, to act in its name. In recent weeks, there have been three such possible acts, one inNew York City and two in Canada by stray individuals who might have been responding, at least in part, to IS calls for action (though we can’t, of course, be certain why such disturbed people commit acts of mayhem). Such acts, in turn, trigger the usual sort of over-reporting and hysteria here as well as further steps to lock down our world. And then, of course, there’s what the militants of the Islamic State can do in Syria and Iraq to put further escalatory pressure on Washington. Despite the Obama administration’s bombing campaign, from the town of Kobane on the Turkish border to the outskirts of Baghdad the Islamic State has generally either held its ground or continued to expand incrementally in the last two months. Its militants are now within range of Baghdad International Airport, a key supply and transit point for the United States, and recently dropped several mortar shells into the fortified Green Zone in the heart of the capital, which houses the gargantuan U.S. Embassy. Similarly, to imagine another kind of scenario, a State Department official recently suggested that U.S. air power be ordered to take out the pipelines that transport Islamic State-controlled oil to market. That was, she suggested, a “viable option” and was under consideration by the U.S. military. As energy expert Michael Klare has pointed out, however, attacking such pipelines “would provide anti-American groups anywhere in the world with a rationale for bombing pipelines on which we and our allies depend. The result could be global economic havoc.” In such a situation, the Islamic State could potentially call on “lone wolves” and jihadi groups across the Greater Middle East to respond in kind. 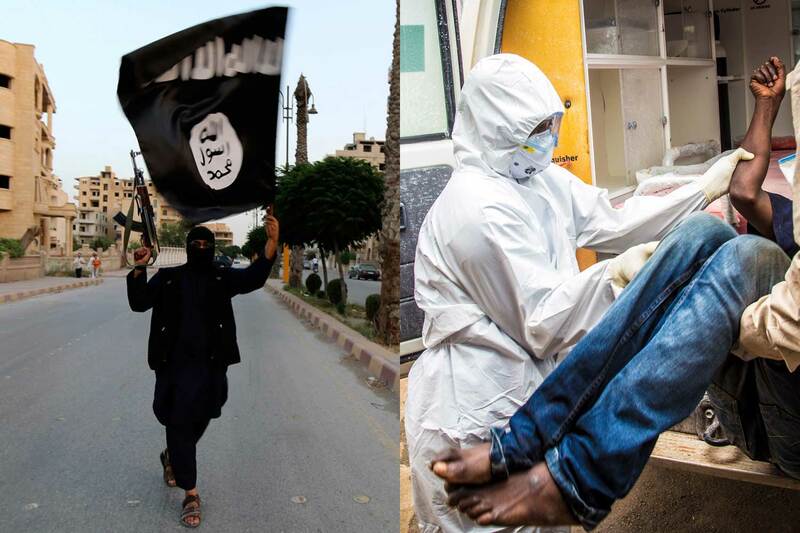 And these are simply examples of moves the Islamic state could have in its own escalatory bag of tricks. At least one more source of potential pressure must be added to Congress, Ebola and the Islamic State: the Pentagon. Thanks to the reporting of Mark Perry at Politico, we know that the most telling bit of domestic escalatory pressure on the president came directly from someone he reputedly respects greatly, General Martin Dempsey, the chairman of the Joint Chiefs of Staff. On August 6th, Perry writes, Dempsey joined Obama in his limousine and, according to an unnamed “senior Pentagon official,” “really leaned into him” on the crisis in the Middle East, saying that it demanded “immediate attention.” A series of White House meetings followed and the next evening the president went on national television to announce the first limited air strikes against the militants of the Islamic State. By early the following month, he had essentially declared war against that outfit and announced “a systematic campaign of airstrikes,” as well as other measures. Another manifestation of military pressure on the White House soon followed, however. From the beginning, the president had repeatedly and insistently taken one thing off that famed “table” in Washington on which all “options” reputedly sit: the possibility that there would ever be American “boots on the ground” in Iraq—that is, military personnel sent directly into combat. This, in effect, represented what was left of Obama’s previous proud claim that he had gotten us out of Iraq never to return. Assumedly, it also represented a bedrock formulation in a situation that otherwise seemed to be in a constant state of flux. In response, the president addressed troops at MacDill Air Force Base in Florida the next day and reiterated his stance: “I want to be clear: the American forces that have been deployed to Iraq do not and will not have a combat mission.” Meanwhile, officials at the White House and in the Pentagon “scrambled” to claim that the difference was merely a semantic one and in no way an attempt by the chairman of the Joint Chiefs to contradict presidential policy. That was, however, clearly not the case. Soon after, Secretary of Defense Hagel offered a similar, if blurry, mantra on the subject of boots on the ground: “Anybody in a war zone, who’s ever been in a war zone, and some of you have, know that if you’re in a war zone, you’re in combat.” Almost a month later, Dempsey himself returned to the subject. Speaking about a future campaign by the Iraqi army against that country’s second largest city, Mosul, in the hands of the Islamic State since that army collapsed, he elliptically indicated his belief that American advisers would sooner or later be heading into battle with Iraqi troops. “Mosul will likely be the decisive battle in the ground campaign at some point in the future,” Dempsey told ABC’s “This Week.” “My instinct at this point is that will require a different kind of advising and assisting because of the complexity of that fight.” More recently, he urged that American advisors be sent to the battle zone of Anbar Province. Meanwhile, retired officials like former Secretary of Defense Robert Gates (“There will be boots on the ground if there’s to be any hope of success in the strategy. And I think that by continuing to repeat that [the U.S. won’t put boots on the ground], the president, in effect, traps himself.”), as well as the usual anonymous sources, drove the point home. If the not-so-subtle public defiance of presidential policy was striking, the urge itself was perhaps less so. After all, a group of frustrated military men would have had no trouble grasping the obvious: that U.S. air power, a coalition of unenthusiastic regional allies (some of whom had aided IS and other extreme Al Qaeda–style groups in their rise), Syrian “moderate” fighters who essentially couldn’t be found, and a sectarian Iraqi government with an army that wouldn’t fight did not add up to the perfect formula for winning a war in the Middle East. With their feet already on the lower rungs of the escalatory ladder, their response was to begin promoting the need for more American involvement, the commander-in-chief be damned. And note that the impulse to contradict the president in an escalatory fashion wasn’t confined to the fight against the Islamic State. When it came to Ebola, Dempsey, Hagel and Army Chief of Staff General Ray Odierno set out on a similar path in an even blunter fashion. In the eye of this storm of pressures is, of course, the White House and a president who seems aware that, in the last thirteen years, American military power in the Greater Middle East has not exactly achieved its goals. And yet, that clearly matters little. Escalation is now a structural fact embedded in the war in the Middle East and the Ebola crisis here at home. It has its constituencies and they are powerful. It is fed by a blend of hysteria and panic that now passes for “the news,” heightened by the ministrations of the social media. Escalation, it turns out, is in the interest of everyone who matters—except us.